It can be a challenge to create new and tasty recipes on a regular basis. I have to admit that I don’t post every recipe I come up with some are just plain bad. However there are days when I stumble onto something new that I can’t wait to share. 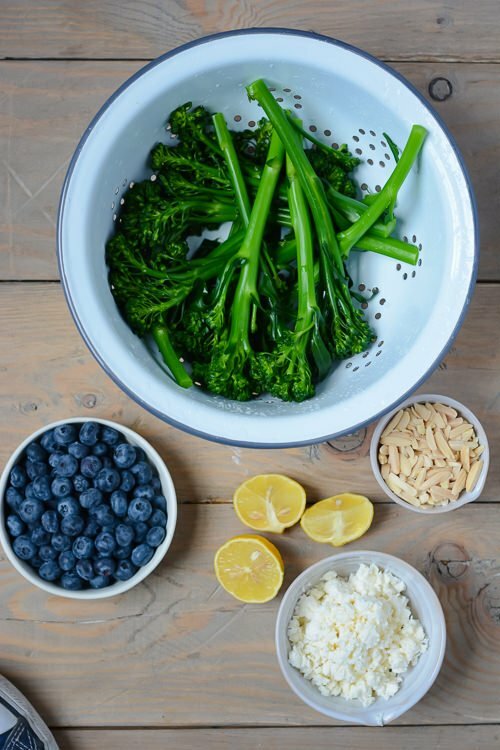 I know what you are thinking, broccolini and blueberries? 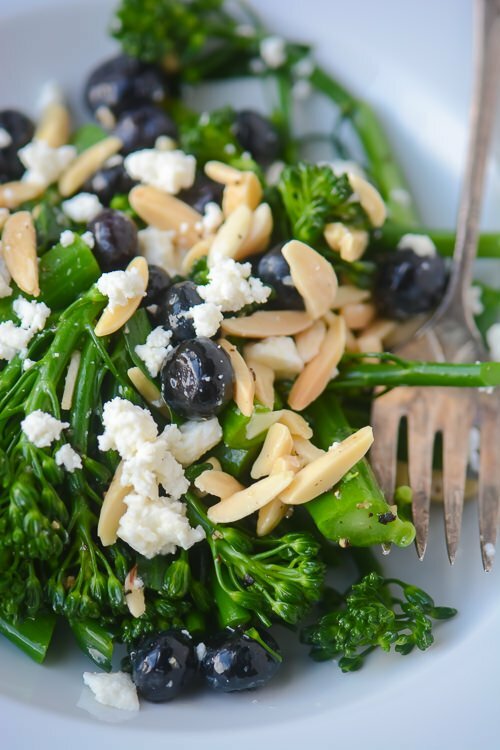 It sounds weird but it just plain works, the sweetness of the blueberries, the saltiness of the feta and the crisp crunch of the broccolini and almonds make a great salad that will keep well and is perfect for packing into a lunch. 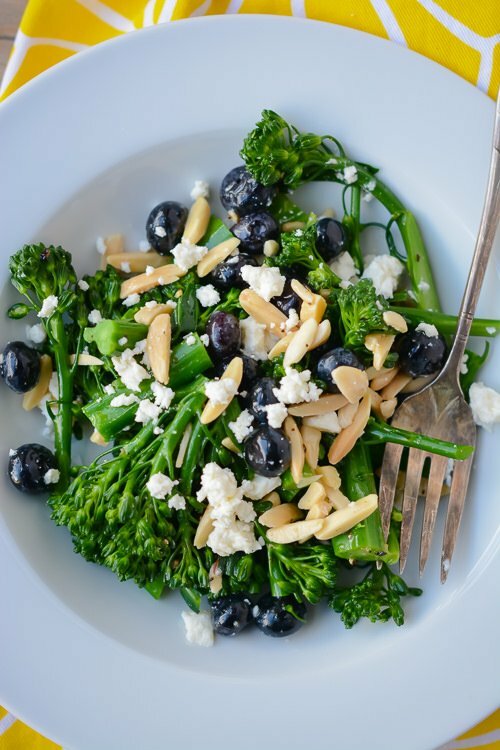 A big bowl of green fruity deliciousness this broccolini salad is full of blueberries, feta and slivered almonds. Perfect for packing into a picnic basket. Fill a large bowl with cold water and a cup full of ice cubes. Fill a big pot with water and bring to a boil. 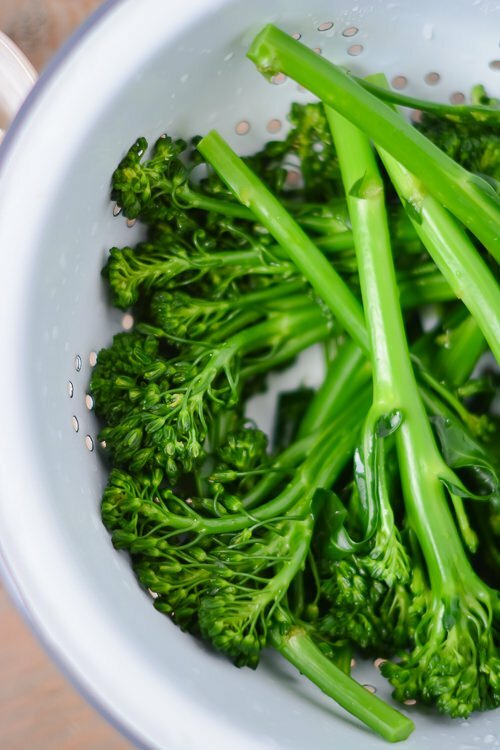 Salt the water and cook the broccolini for 2 minutes, just long enough to take the snap out of the broccolini. Drain and add the broccolini to the ice bath. Drain and pat with paper towels to remove excess moisture. In a small bowl whisk together the lemon juice, white balsamic vinegar and olive oil and season with salt and pepper. 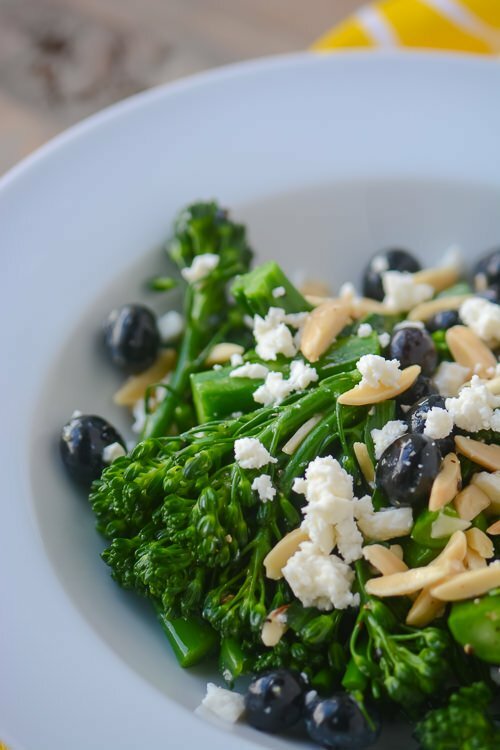 Add the broccolini, blueberries and feta to a large bowl and pour the dressing over the top. Toss lightly, sprinkle with the almonds and season with salt and pepper as desired before serving. I see how this combination would work really well. Perfect lightened-up salad for the start of spring! I wasn’t too sure about this one when I conceptualized it but was super happy with the results. 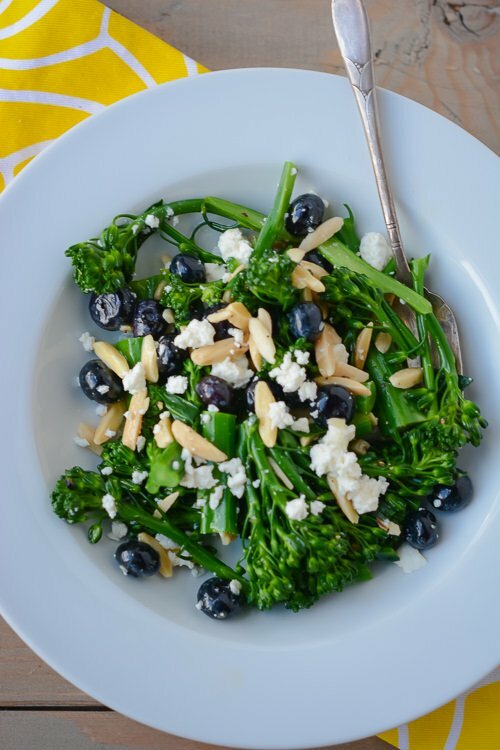 The saltiness of the feta works really well with the broccolini and the blueberries added a nice sweet counterpart. Hope you like it if you give it a try! Wow, what an interesting salad! I love the idea of the high contrast between bitter greens and sweet blueberries. I know it sounds really strange but I thought it really worked well, I wanted to add some dried cranberries but didn’t have any in my pantry. The feta really brings the whole thing together. I hope you like it if you try it! I just want to say Thank You for what you’re doing on here. I’m not sure how I came across your blog, but I’m so delighted that I did- I absolutely LOVE your recipes. Some have seemed a little strange (no offense) at first, but the pictures look so pretty that I can’t help but give them a try, and without fail- I have LOVED everyone so far. So THANKS! Thanks so much. I know that some of the things I come up with can be pretty unusual but I love experimenting with flavor combinations that are a little unexpected. I’m so pleased to hear that you’ve enjoyed the recipes you’ve tried! Thanks again for reading the blog!